The three towers collectively known as RiverHouse Apartments were constructed between the late 1950s and early 1960s. The buildings were named for rivers in Virginia: the James, the Ashley & the Potomac. Woo Lae Oak, a Korean restaurant, was located in a building between the Ashley and the Potomac until a fire in 2006 shuttered the restaurant. Woo Lae Oak has since moved to Fairfax County and the building, which sat vacant for over a decade, was razed in late 2015. Among many notable residents, RiverHouse was home to Grace Murray Hopper, a pioneering computer programmer who rose to the rank of Rear Admiral in the United States Naval Reserve. The park in front of RiverHouse is named in her honor, and she is buried with full military honors in nearby Arlington National Cemetery. She resided at RiverHouse for more than twenty-five years at nearby River House and was buried with full military honors in Arlington National Cemetery. The most notable changes since the towers were constructed have occurred in the area surrounding it. Metro came to Pentagon City in 1977 and spurred much of the development and activity visible in the area today. The Fashion Centre at Pentagon City opened in 1989 on the site of a former Western Electric telephone manufacturing facility. A field sat directly across from RiverHouse on South Joyce Street until Pentagon Row was built in the late-1990s. Photo courtesy of Center for Local History, Arlington Public Library. 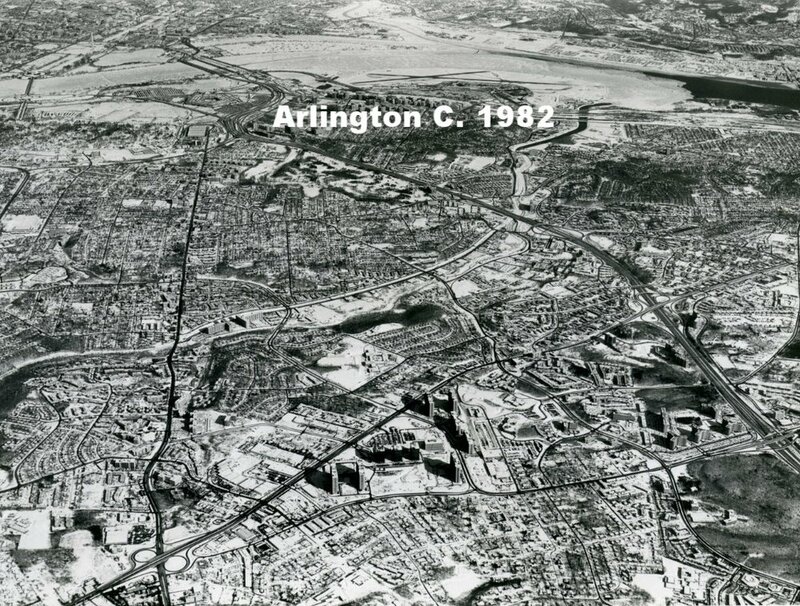 Historic aerial view of Pentagon City and RiverHouse. Historic aerial view of Pentagon City, with the three RiverHouse buildings situated on the lower left hand side. RiverHouse in black and white. Photo courtesy of Center for Local History, Arlington County Public Library.